Al, VE1AKT, was net control last evening on the Maritime Net that meets every evening at 7PM local time on 3750 kilohertz. I was the second station to check in last evening and was welcomed home. I gave them a brief resume of our trip. Al had to cut the net short. Each one simply checked in and Al shut it down. There were 14 stations that checked in. It lasted ten minutes due to an electrical storm. That storm hit the campground here at 11PM and lasted until after midnight. There were some very bright flashes and very loud thunder cracks. It was rather lively for awhile with heavy rain now and then. We were up at 6AM to an overcast and high wind morning. A rather gloomy day and a poor day to welcome us home. I went out and connected the HF antenna. The Weather Net meets every morning at 7AM local time on 3770 kilohertz. Gerry, VE1AAC, was net control of that net. I tuned it in this morning and one could still hear the storm with a lot of heavy static crashes. The Wifi was turned off so we could get into the internet this morning. It was one of the best Wifi's we have encountered while it lasted. It cost $2.00. We hope we do not have to use Wifi again. The best of it that we encountered was quite frustrating to say the least. I called Dave, VE2EDB, net control on the TPN that meets on 7055 kilohertz each morning. There was no one on frequency but Dave heard me and came right back to me. We had a three minute chat from 8:45AM to 8:48AM. Another good chat and good to be back. We hope to check in to this net more this summer. Joan did some more laundry. One can always find some to do it seems. We worked around the trailer. Cleaned the tanks and got it ready to leave. The last thing we did was top up the fresh water tank. We left site 12 at The Elm River RV Park at 10:30AM. We had a quick chat with Neil on our way out who was chatting with the same man his father Winston was chatting with when we arrived. The weather was overcast and we went right to the Equest head office in Debert. We had a good visit with Fran, John was not around. Fran said the horse trailer I described in yesterday's report (part 184) was a year older than our trailer. It was a 2004 and is now owned by the third owner to own the trailer. Winston was fixing the air conditioner in the trailer. It is certainly in good condition. One would agree it looked new sitting there last evening. We left the Equest head office and made straight for Smittys at Clayton Park. We phoned Bob and Flo via On Star and they met us for lunch. The parking lots were full. We had to park way over behind the new medical building. Bob and Flo were there waiting for us but did not see us drive in. They were surprised to find us sitting there waiting for them when they came in to the restaurant. We left Smittys at 1:40PM and went straight to Wilson's Gas Stop at 289 Herring Cove Road. We took on board 77.447 litres of diesel at $1.179 per litre for a total of $94.02 with a saving of $2.71 making the grand total $91.31. From Wilson's we went to Mike's No Frills and picked up some groceries. We departed Mike's at 2:30PM bound for Mitch's in Sambro via the Shore Road. We arrived in Mitch's yard at 3PM. The mileage Glenholme to Sambro was 159 kilometres. A nice easy run. The sun started shining shortly after passing Truro and we wore sun glasses the rest of the way. A nice day but some fog around Sambro. Mitch said they had 30 straight days of overcast skies or rain and the first they had seen of the sun was Tuesday. That was day before yesterday. We hope one and all think it was we who brought the sunshine. Mitch and Josie were excited to see us of course. After we visited awhile we learned the brakes are gone on the old blue truck. Mitch phoned around and finally found that Canadian Tire at Clayton Park was the only place who could repair the truck tomorrow. Mitch topped up the brake fluid and drove the blue truck in on his way to work. I drove their Saturn car and Philip followed with his new Honda car. Mitch took the Saturn on to work and Philip drove me home to the trailer. We put 22,439 kilometres on the truck from the time we left Mitch's yard on November 28th, 2010, until we landed back here in the same spot in his yard today. We towed the trailer 16,163.1 kilometres of those 22,439 kilometres. The have towed the trailer a total of 36,073.5 kilometres since it was built in 2005. 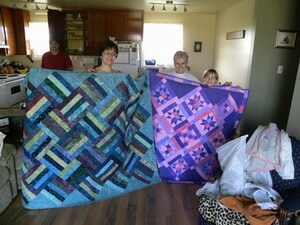 Natasha did not know the second quilt Joan had made last winter was for her. 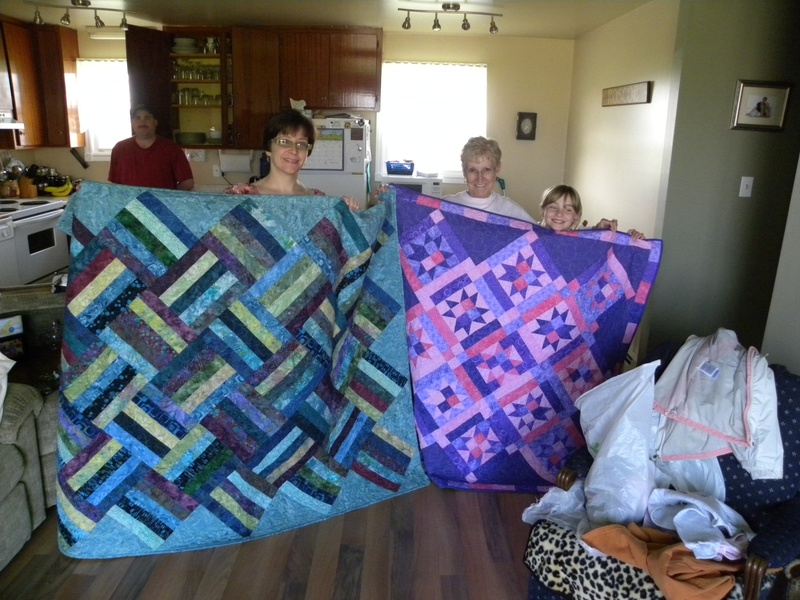 This is Natasha, Joan and Josie with the quilts and Mitch in the background getting another great meal ready. It was a great day. Nice to be home and another day is history.